Christian Writer/Reader Connection: Come on in and Set A Spell, Y'hear? That line comes from the old Beverly Hillbillies theme song. I may not be able to meet all of you in person, but we can share a few moments at our respective blogs. Ah, friends! There's nothing like getting together with our cyber buddies. The rapid comments, the quick emails, the thrill of an acceptance, and agony of rejection make our hearts race. So, today I celebrate all of my blogging friends. I thank God for you. Your prayers, humor, encouragement, support, commiseration, and advice bless me on a daily basis. Whether you're here for the first or one hundredth time, you're welcome to, "come on in and set a spell, y'hear?" So nice of you, Susan. You know it is mutual. 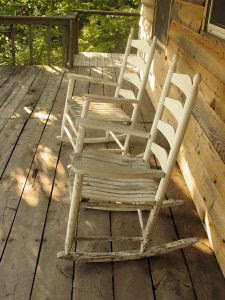 I am from the south and used to sit in a swing hanging on my mama;s front porch, my sister and I would swing and sang, lol, the good ole days. Please enter me into your contest if you will please. My grandma had a lawn swing. We'd sit and talk for hours. Thanks for bringing those memories to mind.